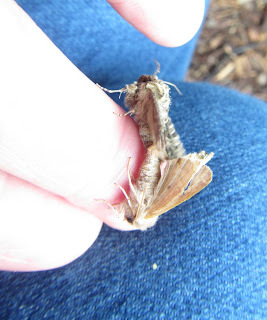 Carmarthenshire Moth and Butterfly Group: Mating Moths? I found these two in the trap this morning. What appears to be a Common Quaker in a mating position with another, as yet unidentified moth. 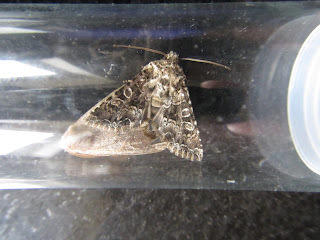 Poor pics Im afraid, the Black and white moth is very lively and even after some time in the fridge they are not still. I will try again later and get a better pic of them from below. Strange things happen in Rhandirmwyn! My guess at i/d is very much a `first shot`, with the rather awkward photo, but the other moth that has `taken a fancy` to a common quaker seems to have `the look` of a Hadena sp. to me - perhaps the variable tawny shears? I may well be wrong. Perhaps the moths will cool down overnight (in terms of their `antics` and temperature) if they are in the fridge, and a better photo can be taken tomorrow. Putting them in a larger container with some herbage to hold on may help them settle and separate.